On Wednesday, September 14, 2016, the Auschwitz Institute for Peace and Reconciliation (AIPR) co-hosted an interactive roundtable discussion at the headquarters of the United Nations in New York alongside the Permanent Mission of Costa Rica to the UN and the Fundación Internacional Baltasar Garzón (FIBGAR). The event, entitled “Universal Jurisdiction: From Nuremberg to Our Days,” featured a panel made up of high-level experts who have participated in three of the most prominent recent cases involving Universal Jurisdiction. Mr. Benjamin Ferencz, a prosecutor in the Nuremberg Trials, was joined on the discussion panel by Mr. Baltasar Garzón, a former Investigating Judge of the Spanish National Court responsible for issuing the arrest warrant against Augusto Pinochet, and Mr. Demba Kandji, the Senegalese Supreme Court Judge responsible for the arrest warrant against Hissène Habré, the former President of Chad. The panel was moderated by Ms. Gina Guillén-Grillo, Chair of the Sixth Committee Working Group on Universal Jurisdiction and Legal Adviser at the Costa Rican Mission to the UN. 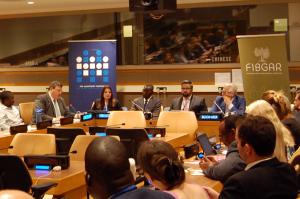 The event was opened by Ambassador Juan Carlos Mendoza, Permanent Representative of Costa Rica to the UN and Mr. Owen Pell, President of AIPR’s Board of Directors and Partner at White & Case LLP. Ambassador Mendoza began by introducing the members of the high-level panel and delivering remarks which stressed the importance of supporting measures for greater accountability in the fight against impunity and the proliferation of mass atrocities, as well as the utility of promoting Universal Jurisdiction to this end. Mr. Pell followed with additional observations on the value and utility of Universal Jurisdiction, especially as it relates to AIPR’s work on the prevention of genocide and mass atrocities. He also highlighted the contribution that Universal Jurisdiction, and a growing acceptance of universality more generally, has made in increasing States’ willingness to investigate serious crimes, as well as the degree to which different national governments cooperate on, and share resources related to, these investigations. The panel began with a video message from Mr. Benjamin Ferencz, the last surviving prosecutor from the Nuremberg Trials. Mr. Ferencz shared many of his thoughts on Universal Jurisdiction and the international community’s acceptance of it. He emphasized his disappointment with the lack of a comprehensive mechanism for the enforcement of international criminal law and discussed his efforts to enshrine the crime of aggression in international law. Mr. Ferencz also spoke about his personal story and the trajectory that eventually led him to take part in the Nuremberg Trials. Mr. Ferencz was followed by Mr. Baltasar Garzón, who was the Spanish Investigating Judge responsible for issuing the arrest warrant for Augusto Pinochet in London. Mr. Garzón spoke about the history and development of Universal Jurisdiction as a legal tool, it’s contemporary utility, and his participation in the Pinochet case. He explained that States have largely failed to see Universal Jurisdiction as a tool for cooperation between different countries and legal systems and instead interpreted it as a threat to sovereignty. 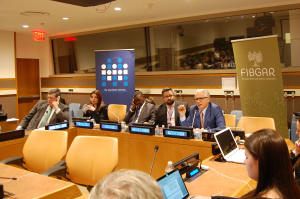 Throughout his remarks, Mr. Garzón underscored the utility of Universal Jurisdiction to better combat impunity in a way that emphasizes reparations to victims of grave international crimes and the protection of human rights. Speaking next was Mr. Demba Kandji, the Senegalese Supreme Court Judge responsible for issuing the decisive arrest warrant for Chadian ex-President Hissène Habré. The conviction of Habré marked the first time that a national court has convicted a former head of state for human rights abuses. In his remarks, Mr. Kandij discussed the history and current state of international criminal justice as it relates to Africa and, more specifically, Senegal. He also discussed the protracted international process of prosecuting Habré and his appreciation for the precedents set by Mr. Baltasar and others, which helped to enable the prosecution of Habré. Mr. Kandij also discussed his belief that the success of cases like the recent Habré trial demonstrates the Africa’s commitment to fighting against impunity and also functions to reduce tensions between the continent and the International Criminal Court. The event’s final major contribution came in the form of a video message from Ms. Dolores Delgado, a Prosecutor of the Audiencia Nacional, who brought a suit against Boko Haram in the Spanish National system. In addition to speaking about her work on judicial cooperation, Ms. Delgado echoed Mr. Baltasar’s statements on the value of Universal Jurisdiction as an important tool in the promotion of these efforts internationally, which work towards guaranteeing security and reducing opportunities for impunity. She explained that, through Universal Jurisdiction, States are able to offer their knowledge and resources to countries that are already investigating the same crime. This enhances the relevant authorities’ capacity to identify and prosecute crimes, providing greater justice to the victims. 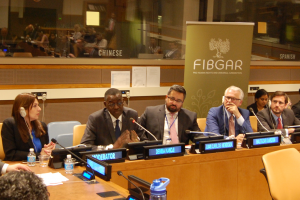 Following Ms. Delgado’s message, Manuel Miguel Vergara Céspedes, FIBGAR’s Legal Manager, delivered a brief set of remarks on the contemporary and future viability of Universal Jurisdiction before the floor was opened to audience questions. The panel concluded the event by answering a series of questions including the viability of using Universal Jurisdiction to prosecute ongoing crimes such as those being committed in Syria, the potential for Universal Jurisdiction to be abused by larger States against smaller ones. The event then concluded with final remarks from the panelists.